ESG Manager – Silvia joined IWC’s Client Relations team in 2017. As ESG Manager, Silvia leads IWC’s efforts in relation to the ESG monitoring of its timberland investments, including setting performance indicators and reporting of such. Silvia also contributes to the continual development and implementation of the company’s ESG management system and sustainability policies. Finally, Silvia is responsible for the due diligence and oversight of mitigation banking investments and provides support in relation to client requests, client reporting, and different cross-organizational projects. Silvia has a M.Sc. in Environmental and Resource Management from the University of Southern Denmark and a M.Sc. in Business Management from the University of Economics-Varna (Bulgaria). Before joining IWC, Silvia has been employed in Novo Nordisk supporting cross-organizational projects and key indicators reporting, among other tasks. 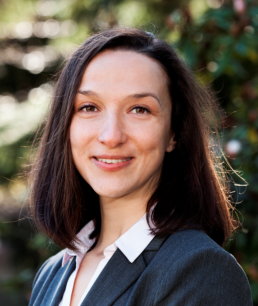 Silvia has also an international client relations experience from the recycling industry (an Austrian-Bulgarian joint-venture), where she has occupied various supply chain and business development roles.